This summer we're diving into Kingdom Unity with a Summer Adventure filled with unity-related books, movies, outings and discussions. This is an adventure for all ages. Check out the opportunities on the right list for you. Check off & discuss as many items as you can this Summer. Join others from Redeemer to celebrate completing the Adventure. Everyone who reaches 100 total points before Labor Day gets a free Redeemer t-shirt at a church-wide celebration! On each list you'll find: Bible verses and the Biblical basis for reconciliation, an autobiography of an African American, race or unity-related books authored by both black and white authors, movies, outings and experiences and articles. Feel free to check out the other lists and intermingle the opportunities based on what works for you. If you have recommendations of items to be listed, please send them to Barney Ford. Why we're doing the Adventure? What is the Adventure for? What do I need to do to complete the Adventure? Are there prizes for completing the Adventure? Why we're doing the Summer Adventure? The 2017 Summer Adventure was developed to assist the individuals and families at Redeemer to be better informed and equipped to live in the unity of Christ while growing as a community that embraces all kinds of diversity in the midst of a broken world. The Adventure is designed to be easy to use and fun to do. It provides good places to start and to continue to learn and grow. Who is the Adventure for? Everyone! Children, teens, and adults of all ages. What is the Adventure for? 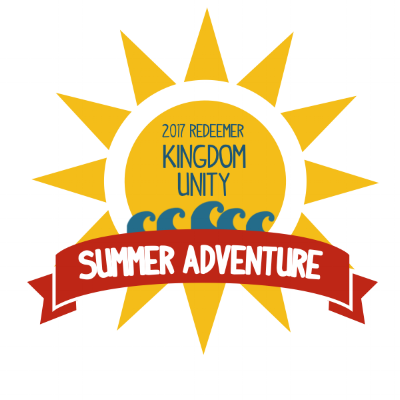 The Adventure provides a fun and easy way for everyone to grow in understanding Kingdom Unity, one of Redeemer’s core values. Kingdom Unity is the pursuit of the Redemption of All Things by pursuing justice and reconciliation - ethnically, racially, socially, and economically. How does the Adventure work? Simply decide to participate (as a family or individual) and select items from one or more of the lists of opportunities provided based on you or your children’s interests and needs. There is no registration. How long does the Adventure last? The Adventure begins on the Sunday of Memorial Day weekend and ends on the Sunday of Labor Day weekend. What do I need to do to complete the Adventure? Earn at least 100 points while having fun learning through movies, outings, books, articles and discussions. The downloadable tracking sheet is just for you (there’s no need to turn anything in). Are there prizes for completing the Adventure? Of course! Everyone who completes the Adventure will receive a newly designed Redeemer t-Shirt. We will also have a Redeemer church-wide celebration to congratulate those who participated in the Adventure and what they learned.